See that thumb in the left-hand corner? Isn't it the sexiest thumb you've ever seen? Huh? Oh this is a cooking blog? Not a look-how-gorgeous-TheHusband-is blog? My bad. But come on - you have to admit, that's a good-looking thumb! Anyway, back to the food: this is another Swedish recipe I tried out. 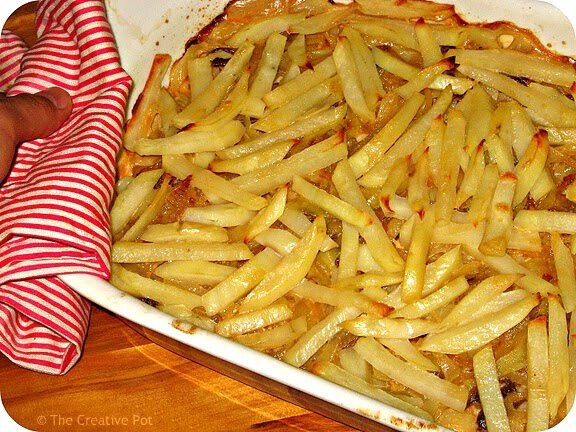 It's essentially a potato bake with the inclusion of anchovies. Both of us were initially a bit skeptical about the fishy component, but you know what, it blends beautifully in with the potatoes without even a hint of fishyness in the finished product. It's just a great creamy bake. And I like the textural diversion that the matchstick potatoes provides. I can see why Jansson was tempted! Note: Keep cut potatoes covered with water to prevent discolouring. Dry off before using. This would fit very nicely at a weekend braai (BBQ)! Yummy Mummy! It is so amazing how anchovies can add so much flavor without being fishy!!! The potato bake is going to be a winner in my kitchen.